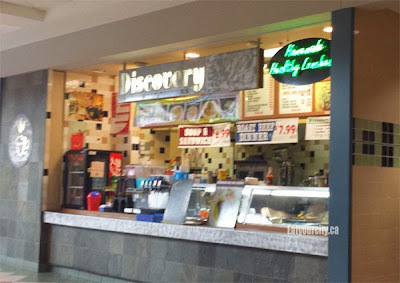 Posted by Discovery Cafe is a gem of a hole in the wall and if you're not in the know, you wouldn't realize that you can get very wallet friendly huge Jamaican jerk chicken meal made with a secret recipe handed down by the owner's mom (or was it grandmother?). So where be this jerk chicken meal you can get year round? 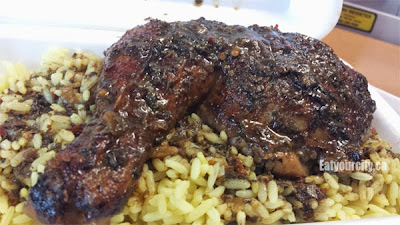 Its tucked away inside Westmount Mall's food court, and its not much to look at, but there's lots of folks that say its the best jerk chicken in the city, so had to try it out. Its usually packed on weekdays at lunch as the students from the neighbouring Ross Sheppard High School usually hike over to the food court at the mall for Nicki's poutine made with wedge fries and a ridiculous amount of gravy and shredded cheese… or Discovery Cafe where for under $10 you get a huge box of beans and rice, topped with a deeply seasoned and moist jerk chicken thigh and drumstick and a side salad. Its quiet in the evenings, and they do a brisk catering business too. The chicken is coated in plenty of secret seasonings.. I stopped trying to figure them out after a few minutes and just enjoyed the multitude of flavours from the jerk seasoning and the spicy heat slowly crept up on me whoooo! 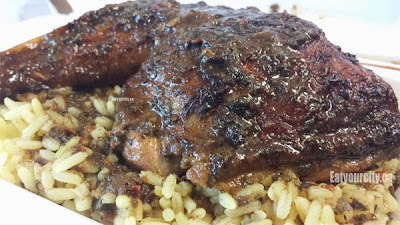 The chicken isn't BBQ'ed and strangely, you don't miss it, but man, this jerk chicken would be outta this world if the chicken was cooked on the grill. Maybe they do that when they cater on the weekends and its nice out. As is, there's lots of delish cooking juices that flavour the rice. The beans in the rice isn't the same type used in the Carribeans (mainly cuz for some reason they're not available here), but definitely reminded me of the cooking down in the islands.. makes me want to go for another cruise! Nom! 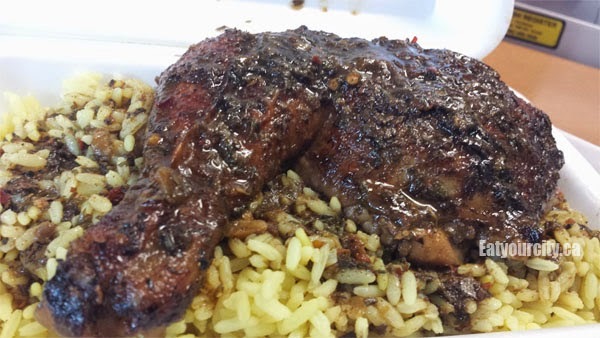 So if your'e in that part of town, stop by and you can have delicious jerk chicken year round. Mmmmm! Now I need some ginger beer to wash down the spiciness.